When homeowners are lucky enough to have a detached garage on their property, they have a space that would make an ideal home office. Detached garages are often found behind homes built in the 1940s and 1950s. Even the smallest garage can yield about 60 square feet of additional livable space, but there are a number of considerations to make before embarking on a renovation. The first is installing electricity and WiFi to accommodate the technology needs of the modern office. Adding insulation and heating will make the space comfortable enough for year-round use day and night. Overhead lights can be added to illuminate the whole office and lamps will provide task lighting at a desk or reading chair. 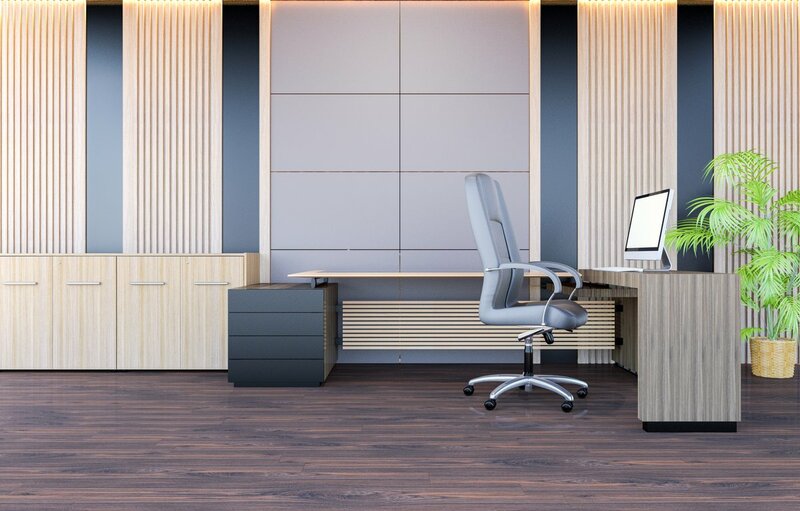 The office heating plan can include radiant floor heating, which is an energy-efficient way to supply heat to a space without installing a duct system or the cost of extending the home heating source to the garage-based office. Frequently, garage renovations require flooring over the existing concrete surface and infloor heating can be installed at the same time as the new floor. For an added bonus in cold regions or places with lots of wet weather, install a covered walkway that connects the converted garage to the house. Radiant heat is often installed in outdoor surfaces such as driveways to melt ice and snow so traveling from home to the office would be an easier "commute" with this added feature. Along with utilities, a garage conversion has to address the elephant in the room, or in this case, the garage door opening and what to do with it. Some homeowners choose to keep the appearance of a garage by leaving the original doors, which preserves privacy and retains the residential look, according to Houzz.com. Others redo the wall to allow for a traditional doorway and windows or install large glass panels to bring in natural light. Garages don't usually have big windows so the additional light exposure would be needed for the interior. Window treatments inside the structure can block light and provide privacy as needed. By retaining the garage's original height, the equivalent of a vaulted ceiling will add to the spaciousness of the office. Installing floor-to-ceiling storage units and bookshelves on the lengthy walls may free up enough floor space to create a seating area with a sofa and chairs in addition to an office workstation.